As I have mentioned in the previous articles in this series(Part 1 & Part 2), information that I present in this guide for Ajanta caves are based on the research by legendary historian of Ajanta Walter M Spink. I was fortunate enough to read some of his books on History and Development of Ajanta. Cave 7 in Ajanta has an interesting history. According to Spink, construction of cave number 7 was finished rather rushed, in AD 469. The patron of this cave might have forced to complete the construction of the Buddha idol in the shrine in a hurry due to the political unrest in the Vakataka Kingdom. However during 469, cave number 7 was merely dug out just enough to accommodate the Buddha idol in the shrine. However, a visitor to the caves now can find a huge number of Buddha images in the Shrine and antechamber walls. They are of different size and postures. These Buddha figures are credited to a later period of refurbishing happened in Ajanta cave number 7. It was around in AD 477 - 10 years after the initial construction of the shrine was finished. By this time, the conventions and styles practiced in Ajanta had changed greatly. It has become a style to incorporate the six Buddhas from the past into the shrine. During the refurbishing, these 6 Buddha figures were carved with difficulty into the shrine. The zeal of those who refurbished Ajanta cave 7 did not stop there. They went ahead and carved hundreds of Buddha images to where space was available. The antechamber walls in front of the shrine is also covered with hundreds of Buddha images, each varying in posture and hand gestures. These Buddhas also suggest the depiction of the Sravasti Miracle (Budha multiplying himself in huge numbers). The portico of Ajanta cave number 7 is also of noteworthy. Ajanta cave number 7 has a unique double portico. There are no paintings inside this cave. The Buddha images were plastered and painted during the construction. However plaster and paint have given away in the process of hundreds of years of corrosion. Cave 8 does not have a shrine and most of the front facade collapsed long time back. Cave 8 was considered to be an older phase Hinayana cave like caves 9 and 10. However it was constructed during AD 462 - 465. One can skip this cave as there is not much to see in this cave. This cave is different from caves 1-8 as it belongs to the earlier Hinayana period of construction. The first phase of construction in Ajanta happened during 2nd century BC to 1st century AD. So, the cave number 9 in Ajanta is at least 2000 years old. Your guide for Ajanta caves can point out a lot of striking difference between the caves that belong to the fist phase and second phase of construction. Front facade of Ajanta cave number 9 looks like wooden construction. On left and right side of this facade there are a large number of Buddha sculptures which was created centuries later by intrusive patrons. The first phase belong to the Hinayana sect of Buddhism and worshiping Buddha's idol was not practiced during the Hinayana phase. Hence in Hinayana caves of Ajanta we don't find any Buddha sculptures or idols. Instead the central space in the cave is occupied by a stupa. Stupa is a commemorative construction in which the relics of Buddha is believed to be stored. On top of the circular Stupa, there are multiple steps of Harmika symbolizing Nirvana. Hinayana sect of Buddhism, in comparison with Mahayana Buddhism followed simpler rituals. Their places of worship(Chaitya-gruha) also were less ornate than the Mahayana sect. 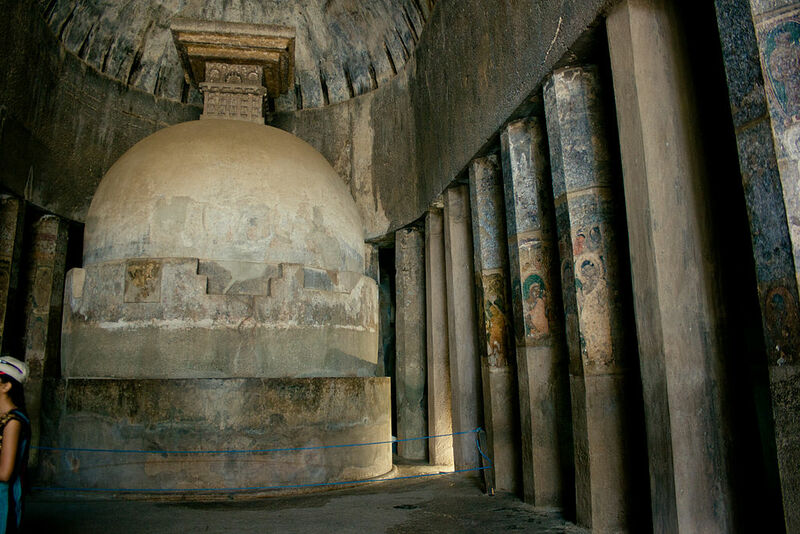 Your guide for Ajanta caves will be able to point out the contrast between simple octagonal pillars in cave 9 and the highly ornate pillars in Mahayana caves like 1,2 and 26. You will be able to see some paintings and Buddha sculptures in front facade and paintings inside the cave 9. Don't confuse it with the Hinayana phase. 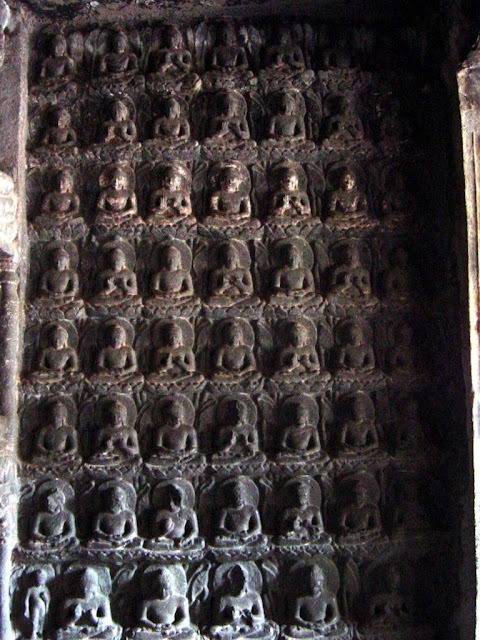 These Buddha images were constructed by various patrons during the second phase of constructions in Ajanta caves. (during the AD 460-80 phase). During Vakataka period, various patrons yearning for spiritual merit donated towards construction of Buddha idols and figures in Ajanta. They even filled the available space in the older Hinayana caves as well. There are four small shrines between cave 9 and 10. They are numbered as 9A-9D. 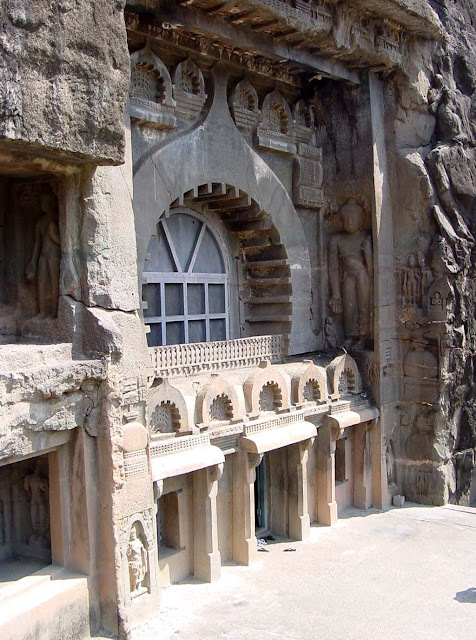 If you are keen on exploring everything in Ajanta, then you can check these caves. Cave 10 in Ajanta is one of the oldest in the site. It belong to the last centuries of BC. Like the cave 9, this cave also has an array of simple octagonal pillars and a Stupa in the middle of the central hall. In ancient days, the ceiling of cave number 10 was supported by wooden rafters. One can still observe the patterns created by them. The wood would have definitely disintegrated over the years. Also, according to Spink, there might have been a teak umbrella on the Stupa which is also long gone. Ajanta caves were rediscovered in 1819 when a troop of British officers-out for hunting- stumbled upon this marvelous construction. On the 13th pillar inside the cave 10, John Smith - the troop leader- scratched his name across one of the ancient paintings of Buddha. One can still read it - "John Smith, 28th Cavalry, 28th April, 1819”. This graffiti is located well above the eye level - around 7feet high. When John Smith and troop initially discovered Ajanta, all the caves were covered in 3-4 feet debris. There are several paintings on the pillars of Ajanta cave number 10. The floral motifs and geometric designs are from BC 1st century are almost obscure. However the painting which were completed in later phase around AD 468 are still visible. It includes a series of white robed Buddhas. Also the wall behind the pillars are also covered with paintings of Buddha in different postures. I have visited here. It is one of the best destination in India. Really nice picture. Thanks fore sharing this.